For groups: Children ages 12 and under receive 50% off. 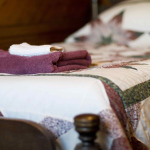 If purchased at the same time as lodging, winter ski passes and rentals are 10% off. 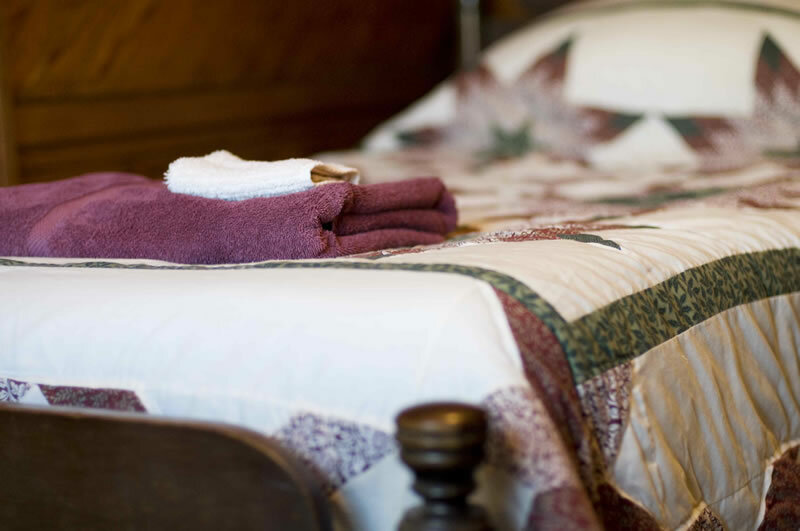 There is a one-time cleaning fee per room a dog occupies of $25, pets not in a room (tenting/RV/outside) are $15. 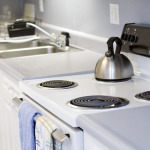 If kitchen is not left clean, there is a $50 cleaning fee. 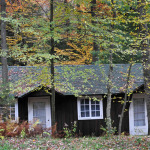 Pennsylvania sales tax of 6% and Lycoming County lodging tax of 5% will be charged, unless proof of tax exemption is provided. 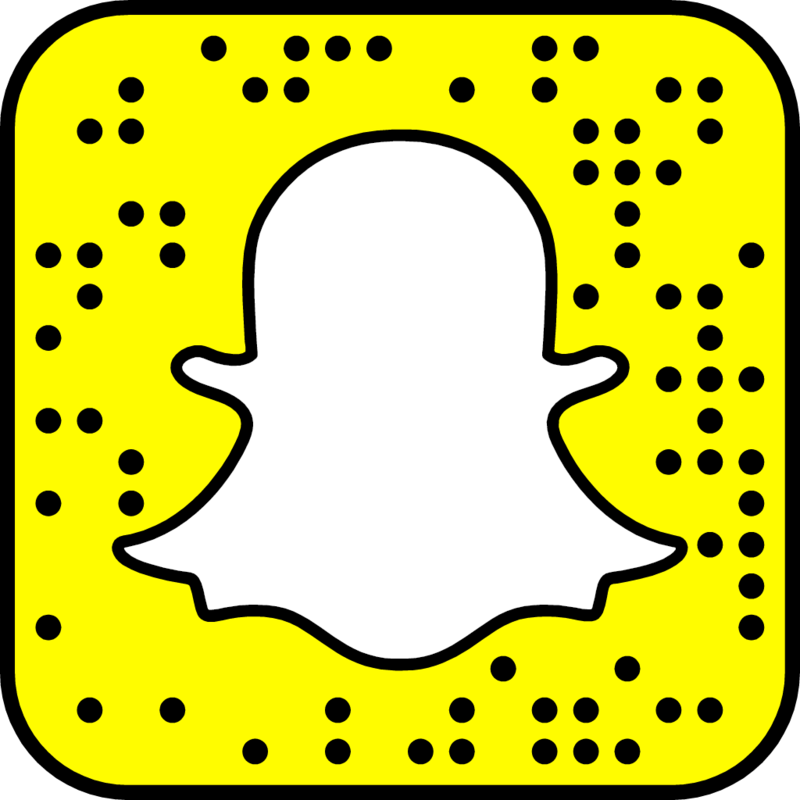 A group consists of six or more people. 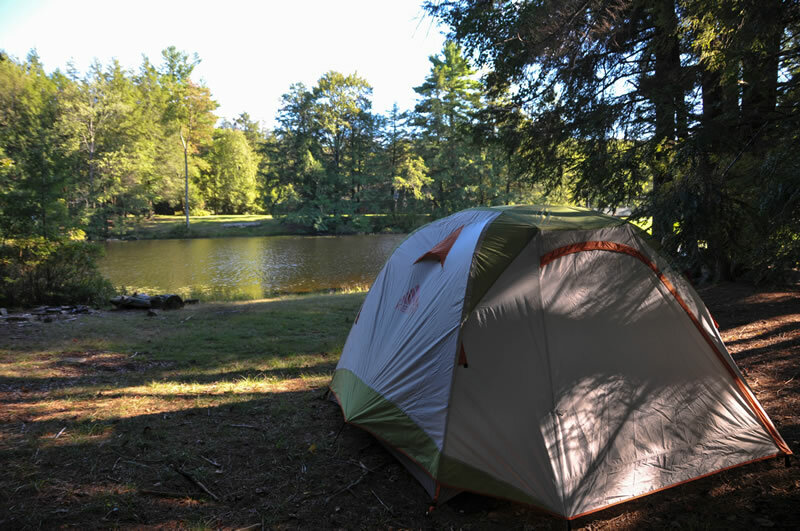 Please email: lucas@crystallakecamps.org or call our office: 570-584-5608. 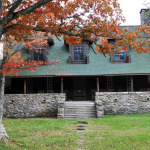 A charming historic lakeside hunting lodge over 100 years old, Laughlin Lodge is nestled in the heart of the Endless Mountains and offers peaceful views of Crystal Lake or the surrounding woods from every bedroom upstairs. 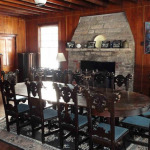 Take the hand-crafted wooden staircase down to the living room where you will find a wall-to-wall library of books and leather couches in front of a grand stone fireplace – the perfect place for curling up with a good book. 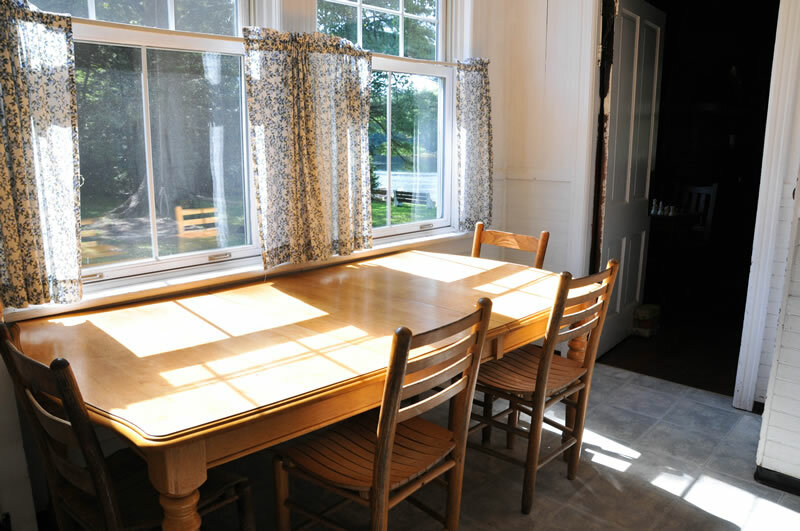 The other side of this large downstairs room includes a dining room table that can accommodate up to 15 people, a wood stove, a chess table and a hutch full of board games. 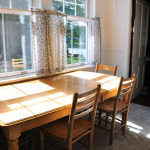 The dining room is adjacent to a modernized kitchen. 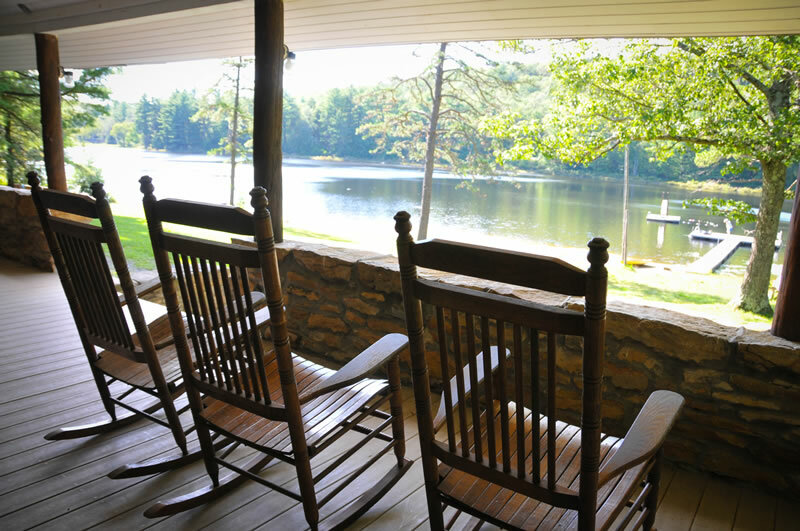 Head out to the wrap-around stone porch to sit in the rocking chairs and enjoy a fantastic view of the lake, just a few feet away. 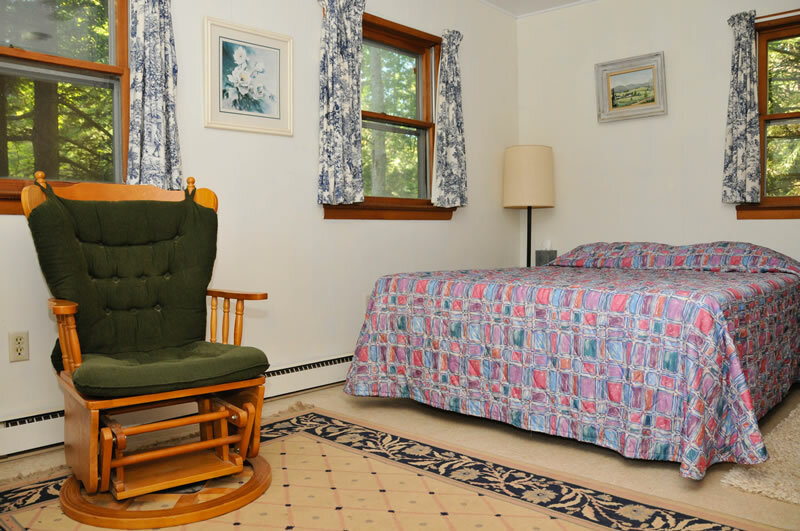 There are two full baths upstairs and two half baths downstairs. 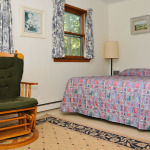 Upstairs bedrooms sleep up to 13 in six bedrooms. 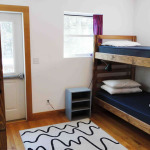 Rooms include two single bedrooms, one bedroom with twin beds, one bedroom with a king-size bed, one bedroom with a full-size bed and a twin, and one bedroom with a full-size bed and bunk beds. 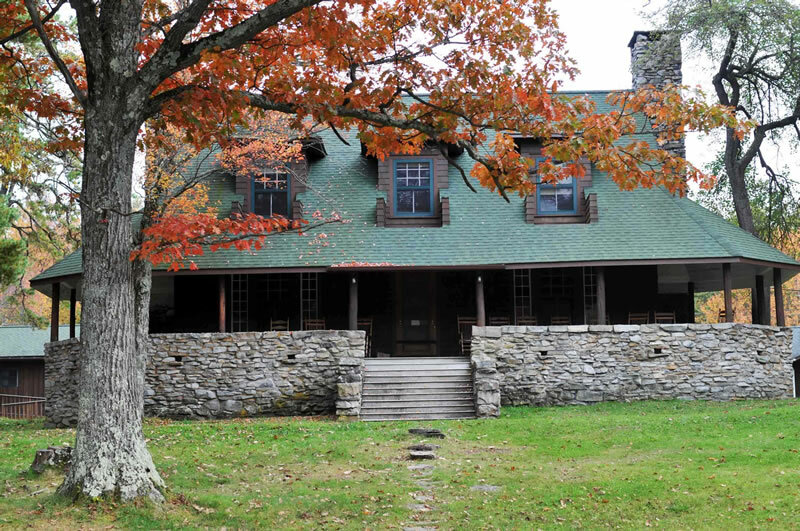 If your group is a little larger than 13, we recommend overflow into Nosoni, just across the gravel road. 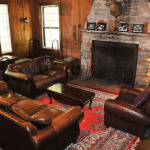 The Lodge is a fantastic space for a large group gathering or a romantic getaway for two! 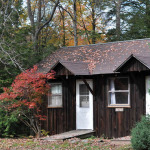 Single occupant bathroom, heated, kitchen access included. 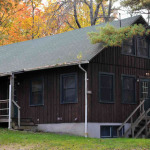 A comfortable and nicely furnished cabin for a party of one to eight people, with overflow downstairs allowing up to 13 total. 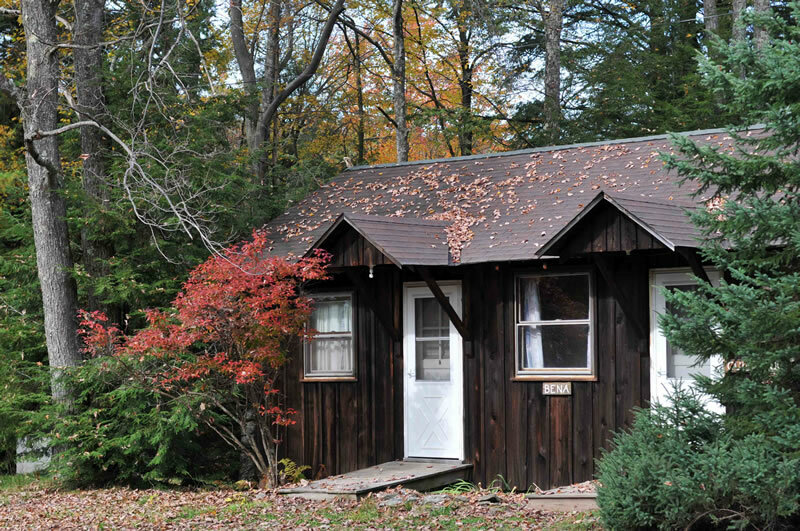 Directly across from Laughlin Lodge and Crystal Lake, this cabin has three separate bedrooms and two baths. 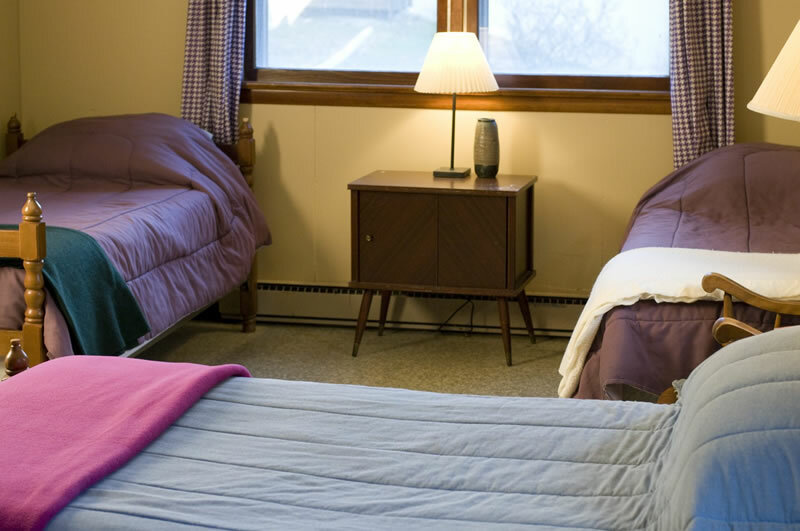 Rooms include one bedroom with a queen-size bed, one bedroom with a full-size bed, and one bedroom with four twin beds. 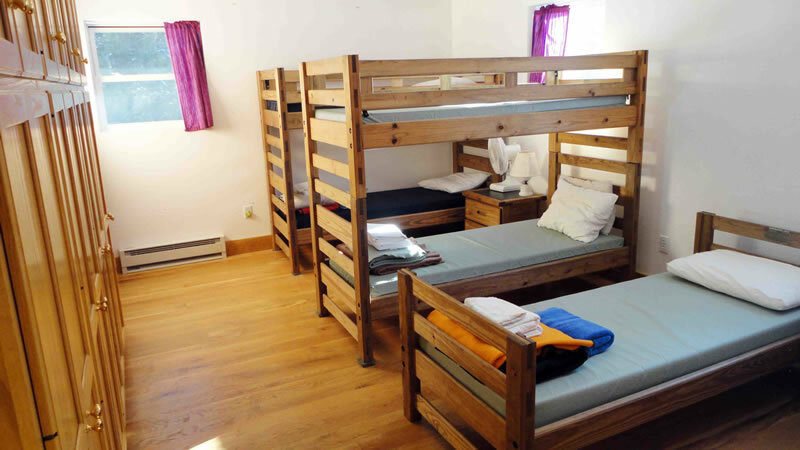 Downstairs there are three bedrooms with two full-size beds and one twin bed sharing an attached dorm style bathroom. 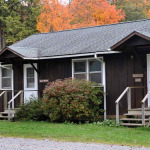 All three rooms have outdoor access to the lower level with a small refrigerator, microwave, hot plate, and toaster oven. Seating area appropriate for a small or large group is also located on the lower level. 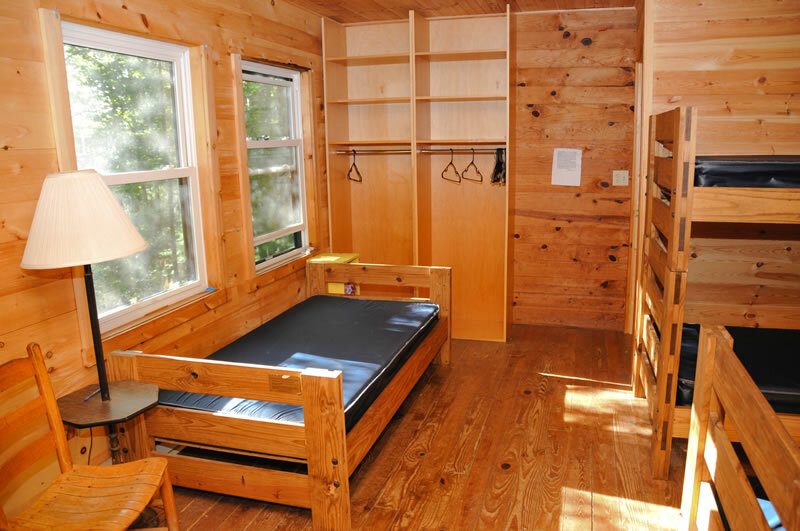 Fresh paint and tall ceilings highlight this newly built, heated cabin with three dorm-style bedrooms with bunk beds. 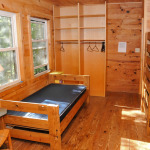 Each room has a sliding wood door for privacy. 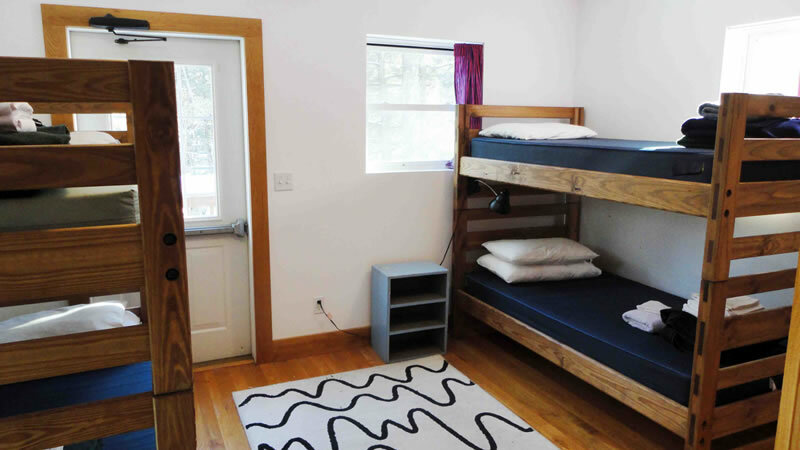 There is a handicap accessible bathroom on the bedroom level, and a dorm-style bathroom on the lower level. 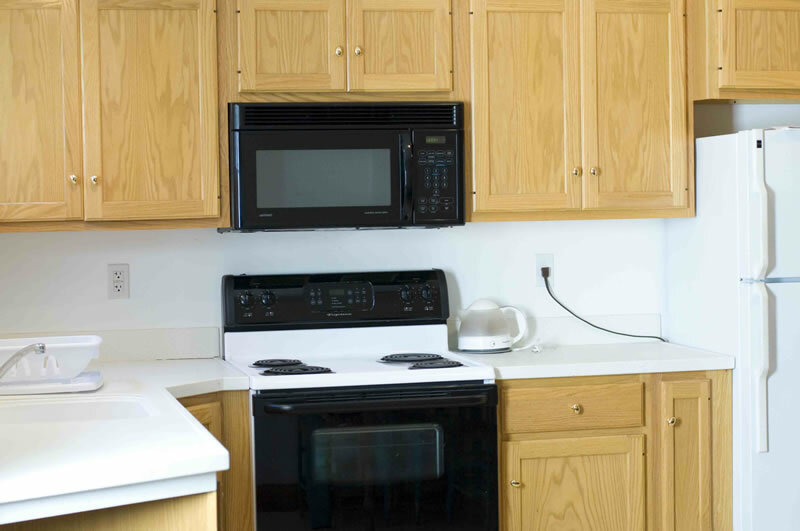 Also, downstairs is a fully stocked kitchen with a range, microwave, and refrigerator, plus a small kitchen table for eating around. 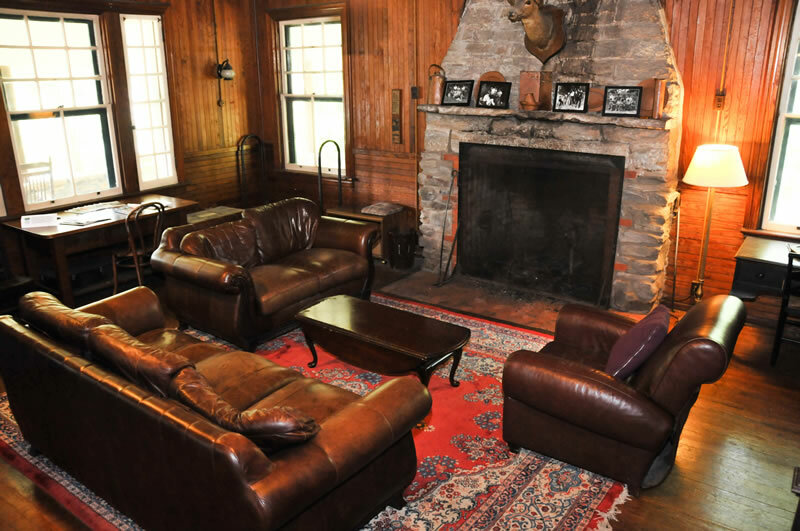 Plenty of couch space for sitting and gathering too. Sleeps up to 16. 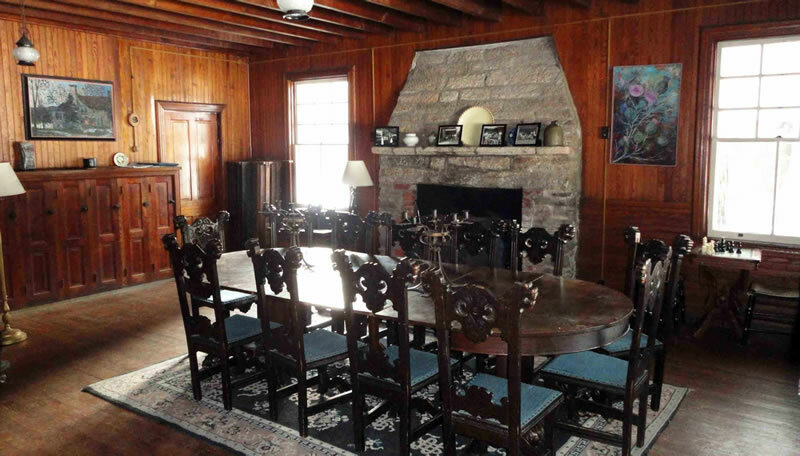 A great space for a large group! 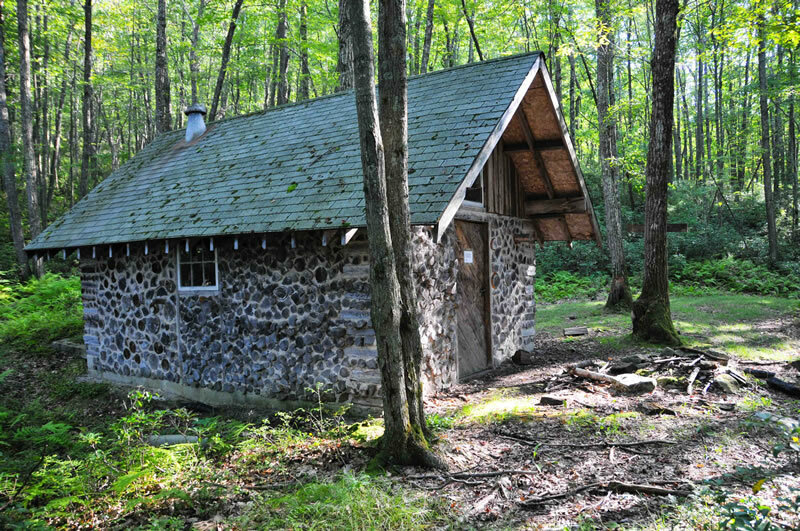 An excellent rustic cabin for a large group of up to 24. 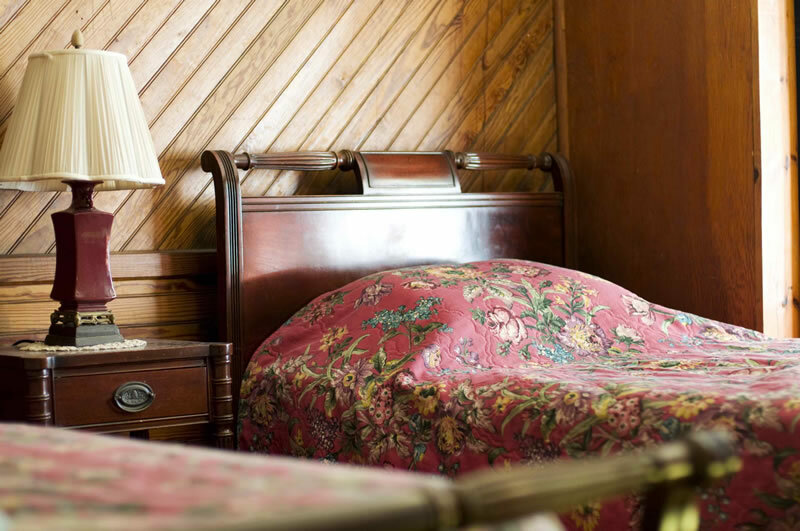 Wood floors and exposed wood paneling add to the rustic atmosphere without sacrificing a clean, well-lit building with modern amenities. 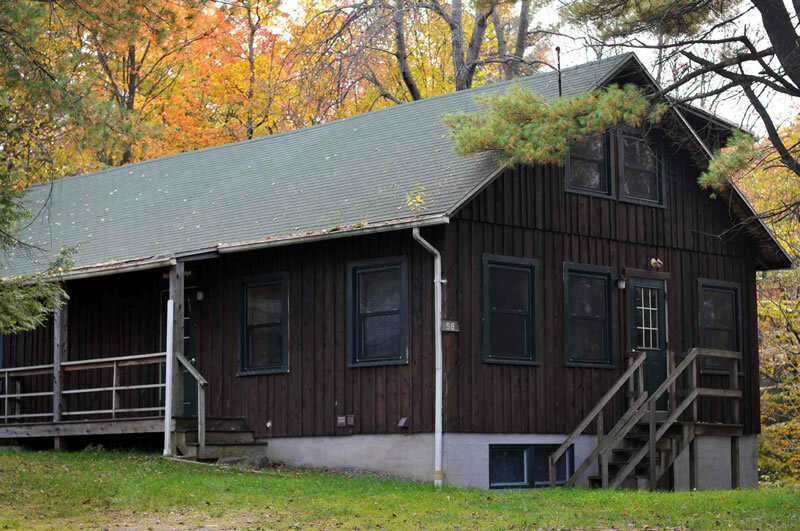 Five bedrooms with bunk beds and locking doors for privacy are on the upstairs level, and three of the rooms look out onto a forested wetland. 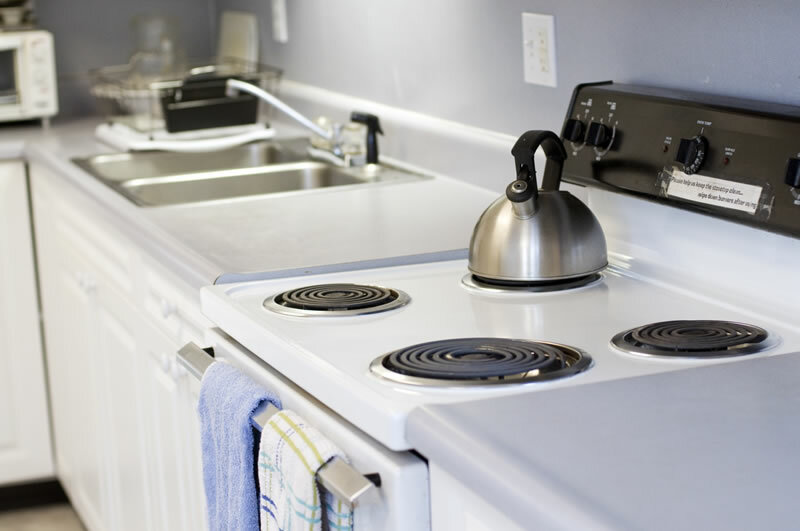 Downstairs is a fully-stocked kitchen with range, microwave, and a refrigerator on the lower level in addition to a sofa seating area. 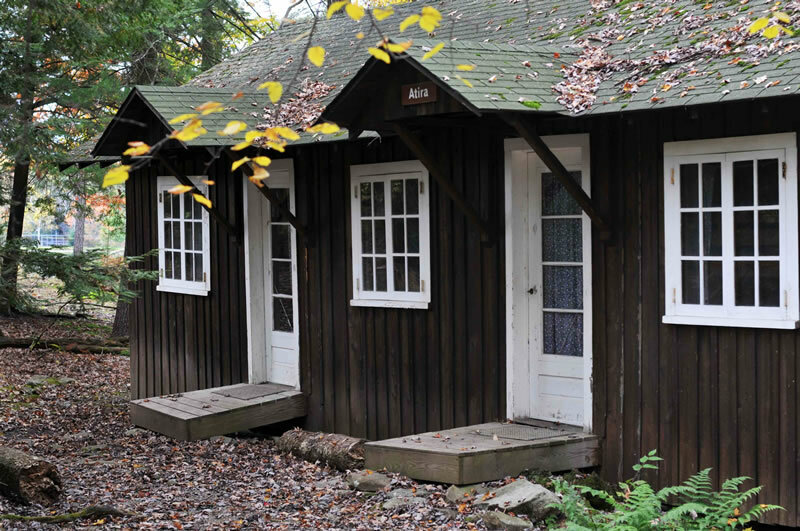 There are two large dorm-style bathrooms on the lower level. 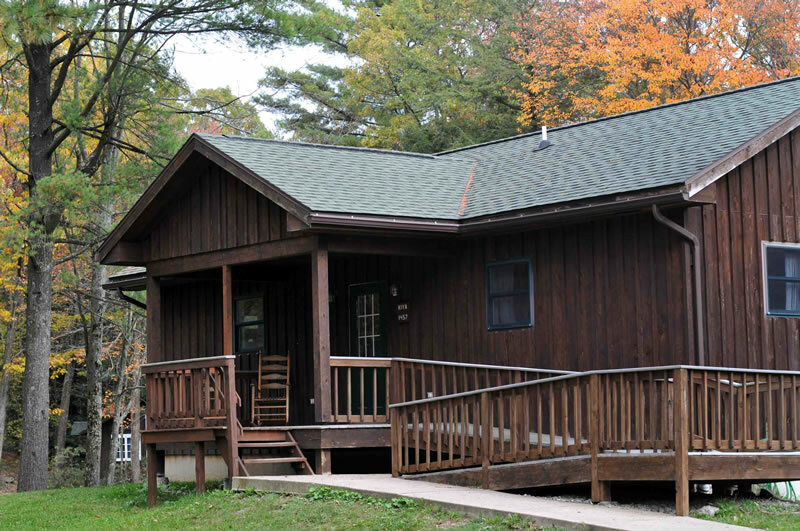 This is a great cabin for a large group looking for space to spread out. 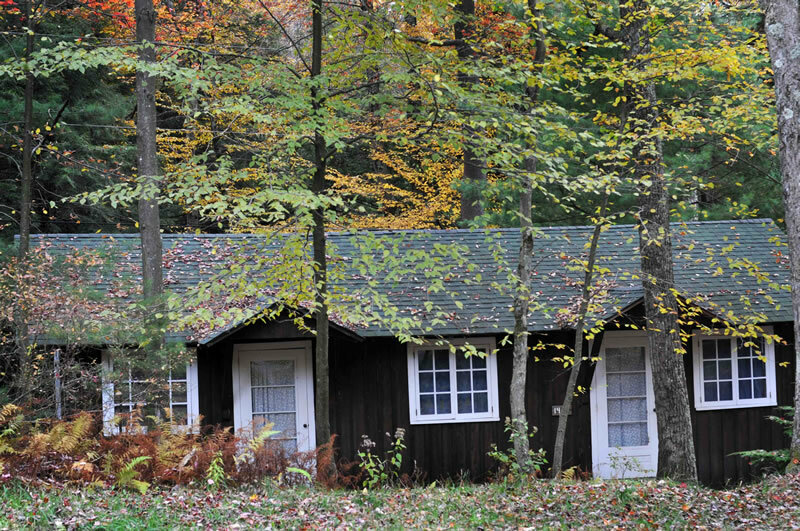 A wonderful cabin for one to four people. 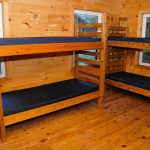 Main bedroom has a queen-size bed, the second bedroom has two bunk beds. 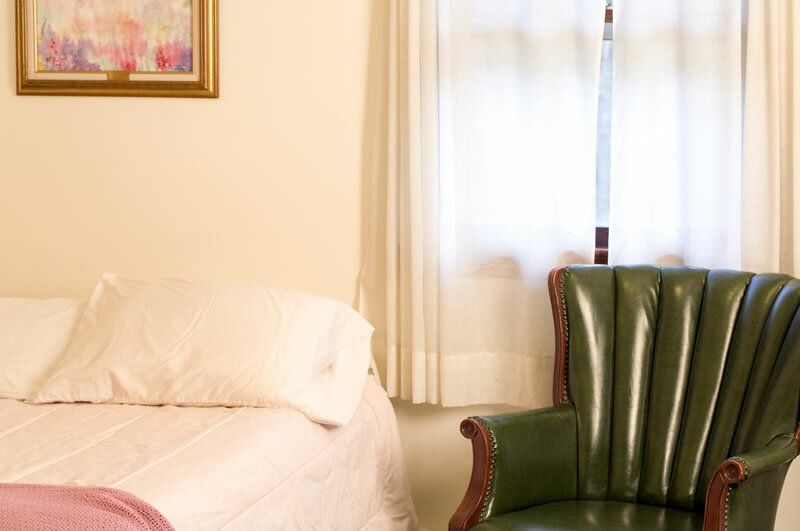 Each bedroom has its own bathroom with shower and there is a separate sitting room with a couch, desk and chairs for reading and relaxing. 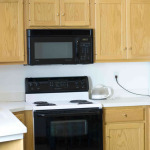 Refrigerator, microwave, hot plate and toaster oven included, but bring your own pots, plates, silverware, etc. 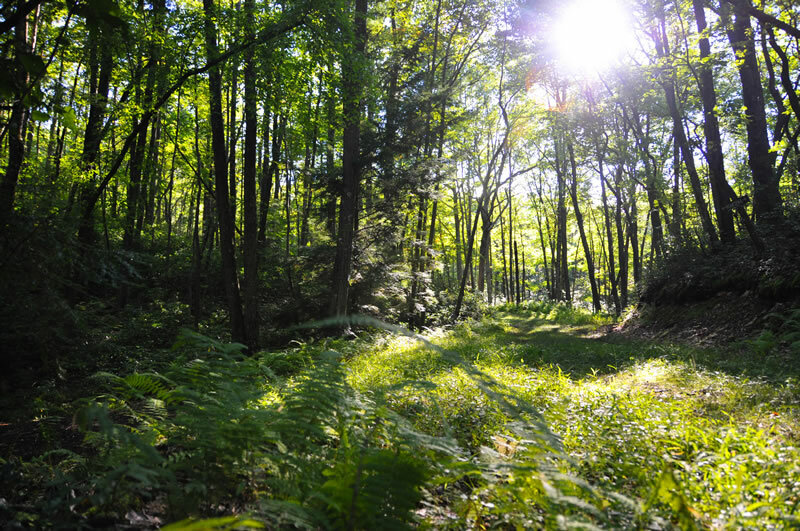 Ready for a wilderness experience? 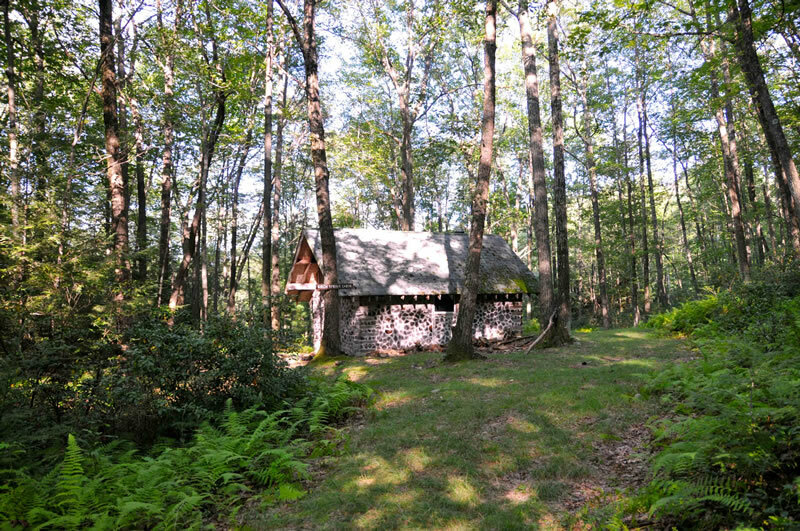 This hike-in, hike-out cabin sleeps up to 8 people, has a wood stove, small table and chairs, as well as a fire pit outside for roasting marshmallows or cooking over an open flame. 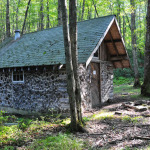 The cabin does not have electricity or running water. 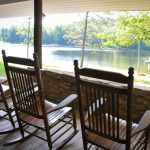 You’ll have a great time bonding through the adventure of back country living! 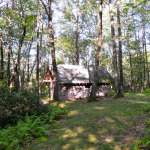 The cabin is about a 1/3 mile hike from the nearest parking area. 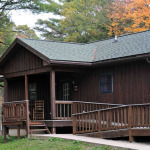 We also offer several unheated cabins for the end of summer, early fall and late spring. 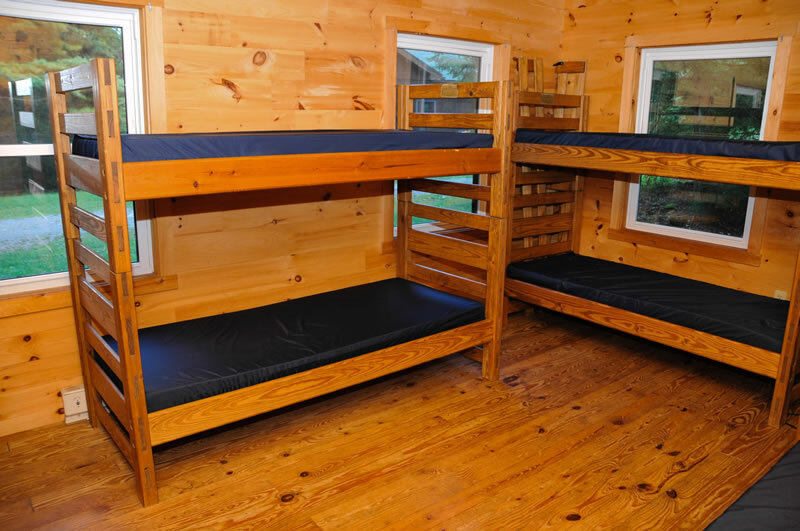 All cabins have bunk beds and sleep between 12 and 18 per cabin. 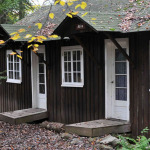 All have easy access to bathrooms with hot water and showers. 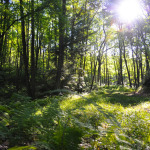 Several are located close to Crystal Lake with the sound of Bear Creek just outside your window. 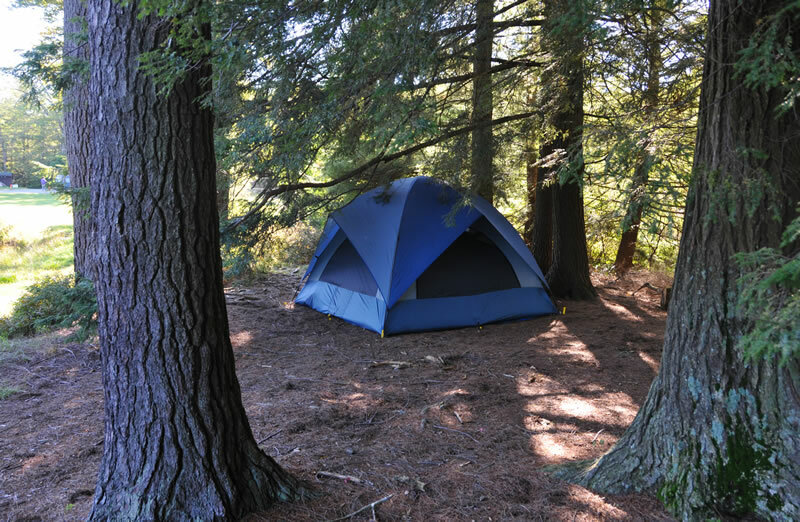 Perfect for scout groups, field trips, and larger groups looking for a more woodsy experience. 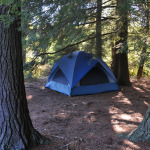 There are several excellent spots around the central area of camp to pitch tents. 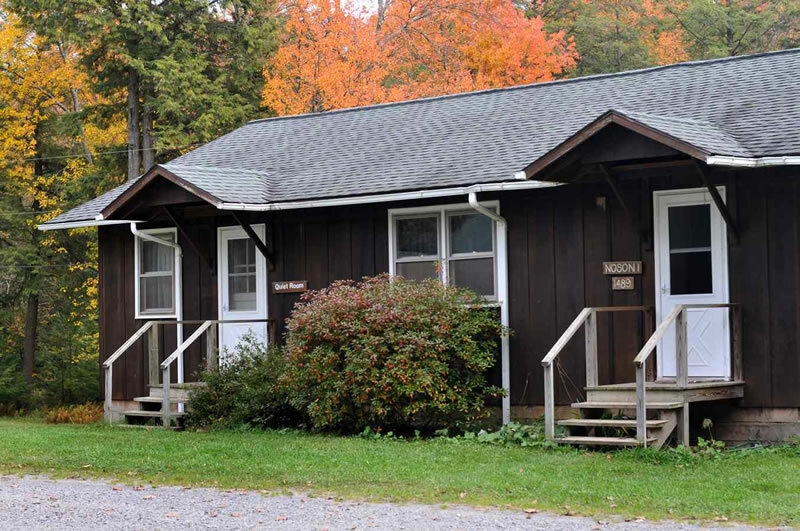 Includes access to central washroom facilities. 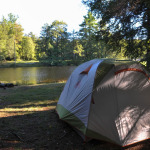 This is a great way for scouts and other groups to get together for a weekend!